Sugar, spice and all things nice. A few days ago I had the pleasure of heading along to Ashley & Co’s re branding and product launch. Here are a few of my thoughts and a few images all of which, and of course are credited to those worthy of credit. What are little girls made of? Sugar, spice and all things nice, that’s what little girls are made of or so they say. The author of this childhood nursery rhyme clearly hadn’t experienced the fragrance and scents of Ashley & Co. What are Ashley & Co made of? Mimosa, lily, sandalwood, wild ginger and ylang-ylang, to name a few scents. All packaged in a simple but elegant matt black interior with gold foil print. Five hundred candles made from home – a modest beginning and no small feat. Ten years later with candles, diffusers, hand wash and hand soaps stocked on shelves both national and international, Ashley & Co is taking the hand basin world in their stride, not to mention the world of all things scented. Founders, Jackie and Ben Ashley and business partner Jeremy have just celebrated the reinvention of their fragrance brand. The celebration was held at the spacious and graceful IMO showroom in Parnell. What was seen, was the expression of a couple’s vision, dosed with some guidance from whimsical imagination. Ashley & Co’s reinvention focused on elegance, simplicity and a bit of boldness, with an aim at creating a personal connection between product and person. Each guest received a beautiful, individually crafted and hand poured candle, the art of which appeared to require much patience, attention and a good pair of dungarees. Once Upon & Time, waxed perfume was a gift well given. Fig Leaves, Gardenia and Vetiver, presented with a message of memorable moments over dates and days. Although I’ve always been a pushover for Ashley & Co, my six year old nearly nephew took a particular liking upon discovering my gift. When asked about the smell his answer included, seaweed and lemonade but as he hurried to correct me ‘ the nice kind of seaweed’. My four year old nearly niece on the other hand exclaimed ‘it smells like boys’, (oh I wish boys were made of this). However, regardless of their lack of experience in the fragrance industry, they both agreed that it was a very handsome looking candle, high praise from two kids whom up until recently have only seen candles on birthday cakes. The gift of soap, although less elegant also enriches the senses and is encased in an urbane little grey box. This particular mini bar, proudly labeled Parakeets & Pearls comprises of goats milk and manuka honey and is not too be confused with a delicious sounding cheese. ‘Enhance your every day’ is the inscribed message etched onto the well-designed packaging and is a clear tribute to Ben Ashley’s background in design. For those of you who aren’t familiar with Ashley & Co, I’ll give you the quick low down. Ashley & Co is about the potential of reality, to connect with yourself and the present and to enhance the little things in the chaos of the big things. Six fragrances run throughout the entirety of the brand taking on the form of candles, body products and diffusers. All products are home grown from little ole New Zealand with packaging that is completely recyclable and biodegradable. 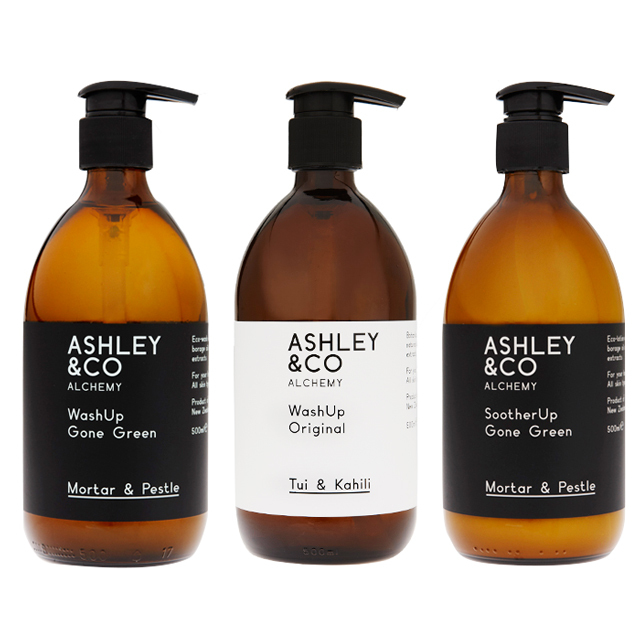 Organic oils are cause for praise on the environmentally friendly scale, with gone green formulas for both a lotion and a hand wash. Made here in Auckland, Ashley & Co and their new look is something to applaud and congratulate. I don’t know about you but I sure wouldn’t mind being made of sugar, spice, all things nice and a little bit of vanilla, wild ginger and lily. This entry was posted in Auckland, General Posts. Bookmark the permalink. ← Cheers to the city and a salute to the suburbs.